Save 10% on Award-winning Q Acoustics speakers now for Black Friday 2018 | What Hi-Fi? Not to be left out, Q Acoustics is celebrating Black Friday by offering a 10 per cent discount across its Award-winning 3000i speaker range, which includes the Award-winning 3010i 5.1 Cinema Pack and ‘Product of the Year’ 3050i 5.1 Cinema Pack surround speaker set-ups. The deals are live on Q Acoustics’ website now and run all the way through to 20th January 2019. 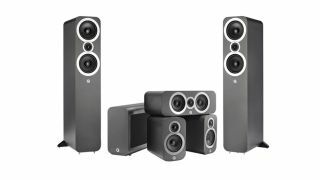 The Q Acoustics 3010i bookshelf speakers (5 stars) are now £179.10 (down from £199), while the range’s slightly larger standmounts, the 3020i (5 stars), have been slashed from £249 to £224.10. Now we get to the 2018 What Hi-Fi? Award winners: the Q Acoustics 3010i 5.1 speaker package, which combines four 3010i bookshelf speakers with a 3060S subwoofer and 3090Ci centre speaker. It’s been reduced from £895 to just £805.50. The floorstander version, the Q Acoustics 3050i 5.1, was £1345 and is now £1210.50. Those wanting to purchase the center speaker and subwoofer separately can do for £152.10 (was £169) and £296.10 (was £329) respectively. The Q Acoustics 3050i floorstanders (5 stars) also receive the discount, now £584.10 down from 649. The 2018 Award-winning Q Acoustics M2 soundbase and its four-star M3 soundbar sibling have also both been reduced to £229 each for the period.